About 100 labourers from Assam left the mountainous State of Arunachal Pradesh on Monday. The drive by the All Arunachal Pradesh Students’ Union (AAPSU) against those not possessing Inner Line Permits (ILPs) was suspended on Sunday, but the exodus of people from the State continued. A report published in the The Times of India stated that out of these 100 people, about 65 people left capital Itanagar and its neighbouring areas on Monday for allegedly not possessing ILPs. This is a travel document necessary for Indians to stay and work in Arunachal Pradesh. These 65 people were mostly from Sonitpur district in Assam. 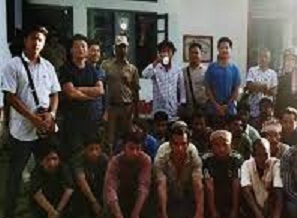 The remaining 35 people – who were working in different parts of Arunachal Pradesh – were from other districts. The report further stated that AAPSU launched ‘Operation Clean Drive’ (OCD) on August 17 last against ILP violators and immigrants after the final draft National Register of Citizens (NRC) was released in Assam last month. Altogether 40.07 lakh people were left out of the list from 3.29 crore applications. After this, most of the northeastern States stepped up their vigil in case those left out of the draft sneaked into their States. AAPSU had identified 2,205 ILP violators in Arunachal Pradesh and ever since OCD was launched, several hundred people from Assam left the State. The student body suspended the operation on Sunday. AAPSU president Hawa Bagang said on Monday that the drive has been suspended for the time being to make sure there was no misunderstanding with Assam. “It is not a drive against the people of Assam. We are targetting only those who are staying here without valid ILPs. We have got 100 per cent support from the administration. The decision to suspend the drive is only to clear misunderstanding and maintain peace with Assam,” Bagang said. He added that AAPSU had to launch the drive to prevent the possibility of people unlisted in the draft NRC from taking shelter in Arunachal Pradesh. The next phase of the drive will be decided on August 23, he said. The All Assam Students’ Union (AASU) Organising Secretary Pragyan Bhuyan stated that AAPSU and AASU had discussed the matter before the drive. “Our district units met the local administration. AAPSU had told AASU that the drive was against the violators, not against anyone from Assam,” Bhuyan said.